It’s worth getting to know, Richmond – even during the winter when the famous castle is infuriatingly closed to mid-week visitors like me, with my small family in tow. 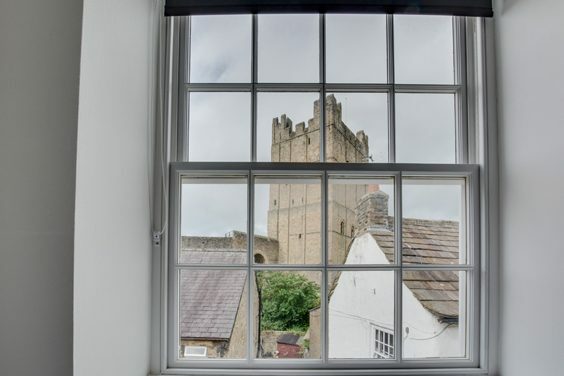 Still, at least our handsome residence, Swale View, offers an impressive, close-up view of the castle’s remarkably well-preserved eleventh-century architecture – you’re practically inside the castle walls if you lean out of a side window. But that’s as close as we get to sampling one of Yorkshire’s standout heritage landmarks. At least the locked gates force us to branch out and look further afield for our cultural fix during our three-night stay – and we’re not disappointed by the rich history in this particularly beautiful part of the county. First though, there’s the practical business of parking and unpacking – and let’s not flinch away from this, if you’re staying at Swale View you really need to get this part right, lest you end up with a parking ticket like we did. So here goes: For arrival you’re directed to one of five parking spaces just off the main market square and about 50 yards from Swale View. These aren’t private spaces, they’re owned by the Council. So, if you’re on time and can enter the property immediately, go and retrieve the guest parking permit from the bureau inside Swale View (you’ll already have the code for the key safe just inside the front door). After you set the clock and place it in your car window it gives you a couple of hours free parking, but no more. So unload and unpack straight away. We’ll come to the overnight parking later. If, however, like us, you’ve arrived fashionably early and decide to go for a getting-to-know-you stroll around the old town before entering Swale View, make sure you first wander back to the market place and buy a parking ticket. Don’t be tempted to put a friendly ‘Staying at Swale View, waiting for access to property to obtain permit’ (smiley face) note in your windscreen. The parking attendants around here are veritable vultures and their hearts are clearly made of stone. Anyway, more fools us. We enjoyed the walk around Richmond, testing out the boutiques and grabbing a few foodie essentials before returning to the car and the inevitable parking fine. But at least it was time to enter the property. 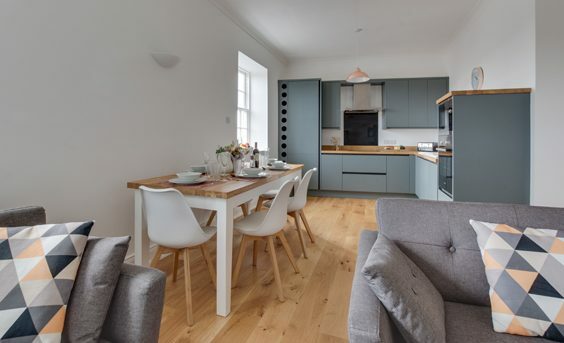 Swale View really is fantastically situated just a stone’s throw from the market square and with incredible views of the town and surrounding countryside – especially from the top floor. 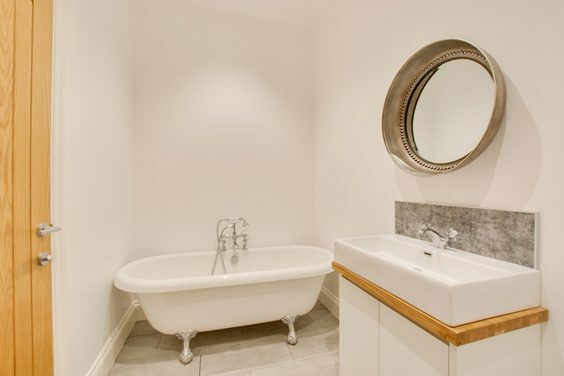 The front door is down one of Richmond’s famous narrow, winding cobbled streets and it opens to a rather dark and dusty communal hallway, but once you’re inside the property – wow – any fears of some out-of-date huddle are immediately erased. This is modern luxury nestling inside a traditional facade. The open plan living room and kitchen are immaculate and well-equipped. 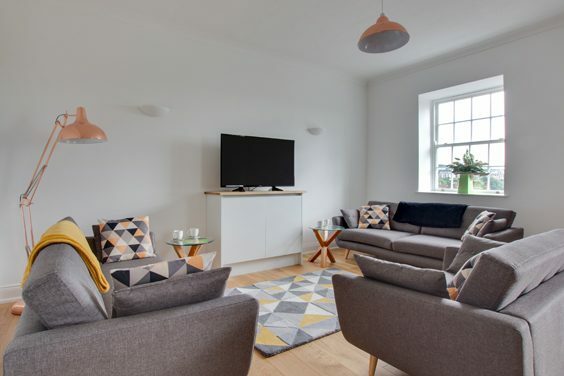 Both are pristine and ultra-modern, with huge TV, designer sofas, touch hob, giant fridge, modern oven, microwave and a lovely, large dining table. We could have done with a fool’s guide to the appliances and the heating rather than just the manuals (reading heating instructions isn’t the most relaxing way to start a short break), but when you’re diving into this much modern equipment you’re bound to have to spend some time familiarising yourself with it. Oh – and I really don’t think the cutlery drawer is meant to be ‘hidden’ – that was just us (it’s a drawer within a drawer, in case you’re as stupid we were). The three bedrooms were bright and clean, with extremely comfortable beds (2 doubles, 2 singles). 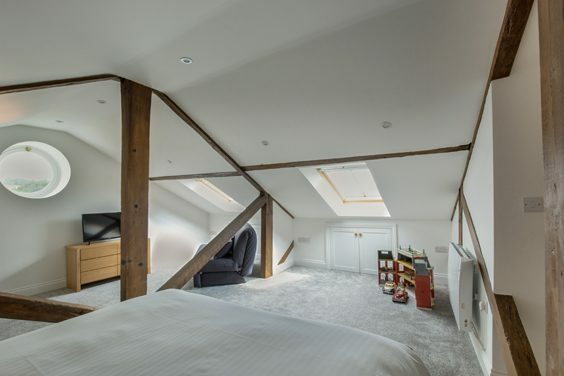 On the top floor, a converted attic made up the main bedroom with en suite. It comes with original angular beams at floor level, meaning the kids loved leaping over them (they liked the room even more when they discovered a box of toys in a cupboard). The two bathrooms had showers and baths and were gleamingly clean. So, after a cuppa and some unpacking, you’re left with the dilemma of the car and the parking. Remember you can’t leave it in the nearby temporary space (or return within 2 hours), so instead there is a second parking permit which can be used in one of two ‘overnight’ car parks – the problem with this is they are both a good 15 minute walk away. One is a pleasant downhill stroll to a car park adjacent to the river Swale (and a steep pull back up) while the other takes you through Richmond to a car park just off the main town. Needless to say, this can be impractical – especially with toddlers in tow – but with a bit of clever planning it won’t be long before you’ve mastered the logistics. After a peaceful night’s sleep we were ready to explore Richmond further. 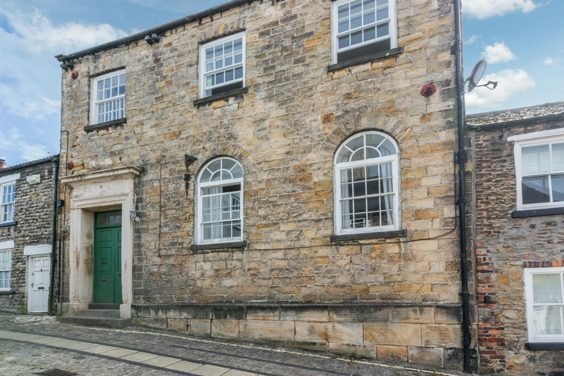 It’s a military town, steeped in conflict and history, exemplified by the excellent Green Howards Museum which is based in the former trinity Church in the marketplace (Catterick Garrison, the principle military base in the north is nearby). Shopping is a curious mix of household names sitting next to indie boutiques, designer stores sharing letterboxes with charity shops and delis mingling with fish and chip and fast food outlets. We ate at a couple of restaurants: A decent, very friendly Italian called Alessandro’s and a nice-but-pricey French bistro called Rustique. (Although the fish and chips from Castle Fisheries were just the job after a day exploring). The real delights of Richmond, though, are the backstreets. Tower Street and Frenchgate offer a genuine step-back-in-time feel. Their cobbles always leading somewhere picturesque, their gentle charms untouched, seemingly, for centuries. The surrounding area offers up all manner of cultural delights. We visited the astonishingly well-preserved Easby Abbey (and bravely attempted a winter picnic), just a mile away. Middleham Castle, the childhood home of Richard III is 8-miles away and Stanwick Iron Age Fortifications showing the Iron-Age power-centre of the Brigantes, are a 15-minute drive. We enjoyed a day in Barnard Castle, just 12-miles away. There, the Bowes Museum, was the highlight of the trip – and if you get a chance to see their clockwork Silver Swan in action, you’ll witness something truly beautiful and strangely moving. Back in Richmond, we were lucky enough to see the Christmas lights. They looked particularly pretty twisting around the obelisk in the market square. We did miss the well-known market, though – another reason that you might prefer to visit the town on a weekend rather than midweek. Whatever, Richmond and the surrounding area might just be Yorkshire’s cultural gem. And I doubt you’ll find a better place to take it all in than Swale View. Available to book through Ingrid Flute Yorkshire Holiday Cottages, part of Original Cottages.